preferably a leather jacket. All jackets are all acceptable besides the "White Leather Jacket", "Red Leather Jacket" the "Lone Wolf"and the "Modded Suit Vest" as shown below. Also the "Skull Face Bandanna" is only to be worn by Officers. 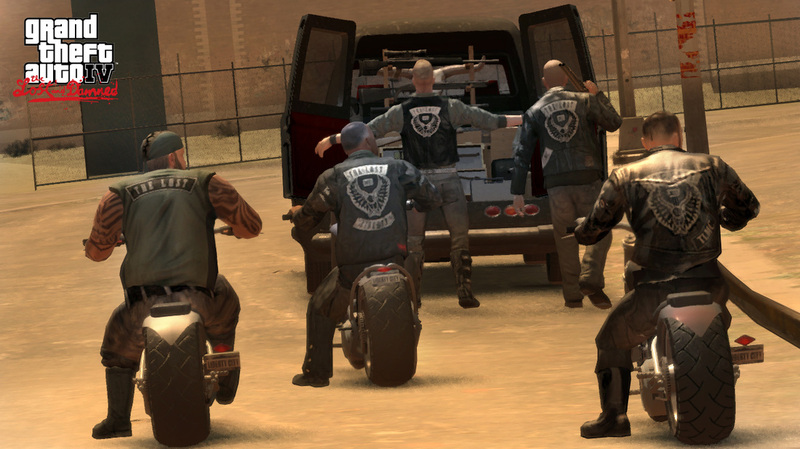 In GTA IV's Lost and the Damned Multiplayer, each member must be wearing clothing bearing the LOST MC Logo. No dress codes apply for Regular GTA IV, The Ballad of Gay Tony or Red Dead Redemption. as long as it is not the spiked helmet or the skull bandanna. Must wear the blue flamed Lost jacket and the skull bandanna. The red trimmed Lost jacket and the spiked helmet is reserved for Djcool132132132.